Sunday was the day of a local meeting for the convention we run our annual blood drive with, so there was only time to run to a single store – Beadtopia in El Segundo. I was in such a rush I forgot to take a pic of the outside of the store, but it is easy to find, nestled in among older storefronts on a quaint side street downtown. Beadtopia is one of the smaller stores on the Hop so far, but no less packed with goodies – a few of which I had been kicking around needing, such as Tool Magic tool dip and some dragonfly charms of a higher quality than the ones I had tried in the past from a store just down the street from my house. Note to self – closer is NOT always better. I was charmed – pardon the pun – by a Make and Take bracelet at the counter. The hard decision was what finish to get it in – gold, silver or copper. I always go for silver, so this time I got the gold one, just to be different and because it was shinier! Their selection of charms, as I have mentioned earlier, is of a much better quality than a certain local store who shall remain nameless. It’s just a shame that Beadtopia is a freakin’ 50 minutes away through the worst traffic corridor in Southern California – the San Diego 405 freeway. Future forays here will have to be well-planned and thought out, but they could potentially be worth it. Gifts – a large, beautiful silver feather charm on a carded poem and a punch card for 25% off five strands of beads on my next visit, good until March 31, 2015. Being wretchedly ignorant of all things Dickinson, the store owner’s attempts to get me to enter their poetry contest failed, but it didn’t put a dent in my enthusiasm to check out a new store. Something on the back wall I really liked (and wished they had more of) were LARGE TUBES of Miyuki Delica Beads. I mean, I’ve only seen them in tiny vials before. Who would have thought they came in bigger quantities?!? Nice! I gave a vial of silver-lined and oil-slicked seeds a new home. To say they are friendly here is an understatement. There were cookies out and we got into at least 30 minutes of discussion on Doctor Who, James Bond and family stuff with them and the other customers. No one was in a hurry on this quiet Sunday and that was worth the trip in of itself. I gave out business cards and may have gained a new peyote stitch student if she calls me. Top, left to right – acrylic roses, key charms, silver filigree toggles. Middle – left to right – Silver dragonfly charms, Miyuki Japanese Seed Beads in oil-slicked and silver lined colors, more dragonfly charms. Below Middle – left to right – silver feather charms. 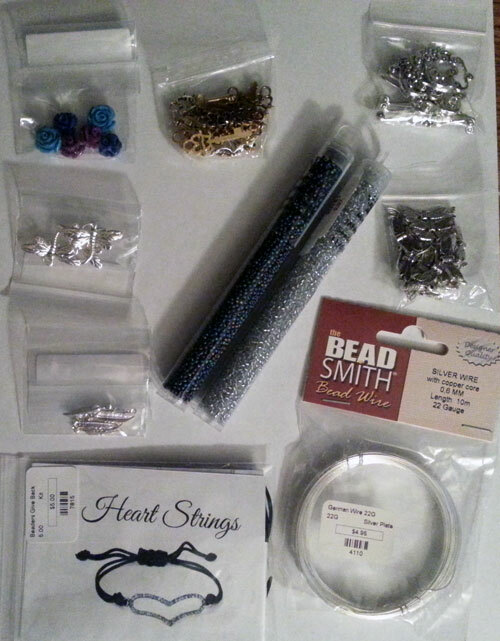 Bottom – Make and Take “Heart Strings” bracelet, 22 gauge silver bead wire. That’s it for this first weekend of the Shop Hop. 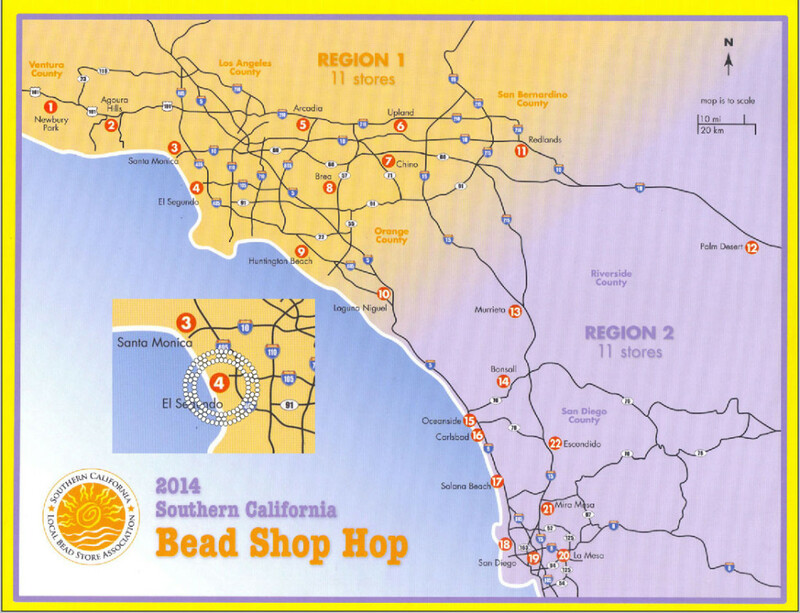 Store posts will resume on Monday, but in the meantime, check back tomorrow for The History of the Southern California Bead Shop Hop.